Our product range includes a wide range of electrical shock proof rubber sheet. 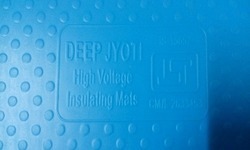 We have gained huge repute by offering high quality Electrical Shock Proof Rubber Sheet. The finish and remarkable flexibility of our offered rubber sheets is acclaimed across the industry. We procure the water proof sheets featuring remarkable dielectric strength that works best for electronics and automobile industry. Further, the highly durable sheets are available in stock and custom sizes that can be ordered in choice of colors.